Had my first, entirely free day yesterday. The kids were at Grandma's house (yippee!) 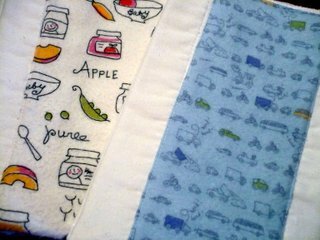 and instead of balancing the checkbooks and starting our taxes like I was supposed to, I cleaned house, organized, and made more burp cloths. Another set of three, two with the truck flannel. I'd been wanting to do something for an expectant friend (scroll down to the last picture. See? I wasn't kidding! 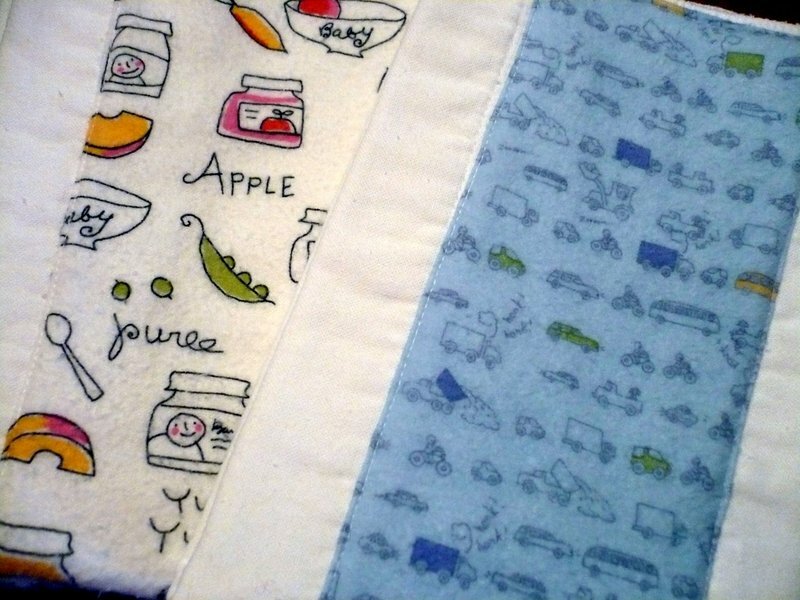 ), and when I saw that I had the flannel that matched one of these, I just had to make more burp cloths. Do you know how hard it is to make things for someone who knits, embroiders more beautifully than anyone I know, felts, cross stitches, sculpts with polymer clay, and is an all around crafting whiz? I'm sure I left out some other things she does, but ha! Kristin doesn't like to sew with a machine (yet). So, while I'm getting some practice and gaining confidence, I can make her some things that would take her too long to do herself by hand. Now I just have to include something for big brother, and then mail off the package. Hopefully it will arrive before the new baby does! I know I've gone and spoiled the surprise, but I just couldn't resist another burping post. I think I got it all out of my system now. I know just what you mean. It's really hard to make gifts for talented, creative people. She'll love the burp cloths. oh Michelle!! i've got tears in my eyes! and not pregnant hormonal tears, but the true "I'm so touched" by your kind words and generous gift kind of tears. you are so sweet! (and so right ON! it would take me forever to handstitch something like that!!) thanks so so much!!!! I love your burp cloths. They really are the perfect baby gift. Kristin will love them! Aww...those are super cute too. I am sure that it is very difficult to make something for someone who crafts! How nice to have had a day to yourself!!!! !